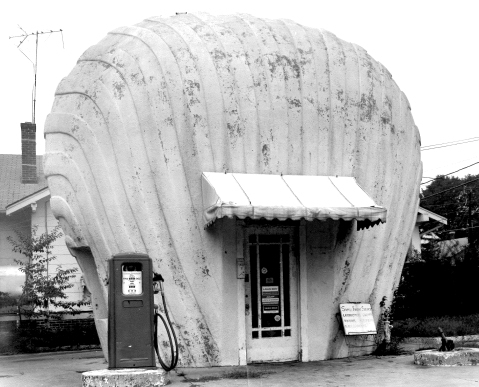 On May 13, 1976, the iconic Shell Service Station on East Sprague Street in Winston-Salem was added to the National Register of Historic Places. Built by R.H. Burton in 1930, the station was one of eight constructed around Winston-Salem that year in an effort by the Shell Company and its local affiliate, Quality Oil, to boost marketing in North Carolina. The Sprague Street station is the only one of the eight still in existence. The building’s design was modeled on the logo of Royal Dutch Shell Oil at the time, and the structure was built by first boxing in the interior office and then adding a wire frame in a shell shape around it. Concrete was then poured on the wire like stucco, giving the building its distinct shape. The station reflects the literalism of advertising of the era, and it is a great example of the Pop architecture that became popular around the time. After the structure was used as a lawn mower repair shop and had fallen into disrepair, Preservation North Carolina raised funds to bring the landmark back to its original condition in the late 1970s.